Rowing-alone & circuit rowing workout programs to take your fitness to the next level. Whatever kind of rower you are, we’ve got you! Burn fat and build endurance with these 14 workouts that real rowing crews use to train. This rowing workout plan requires nothing more than a rowing machine, water and a sweat towel. No workout will take you longer than an hour. Simple and effective. Unleash your inner Olympian! Kick workout boredom to the curb with these 15 fat-burning, strength-building workouts. These are the rowing workouts that UCanRow2 is most known for. They come straight out of our Bodyshop living lab / fitness studio, and you won’t find them anywhere else online. They’ll have you on and off the rowing machine, ramping up your rowing with strength moves for athletes (That’s you!) from beginner to advanced. We get it! Who wouldn’t struggle if all you’re going to do is pull on the rowing machine handle with no real plan, and no real goal in mind?? Yuck! That’s crazy, and SO unnecessary. how to put them together. We do, we’ve been doing it for decades! In the past, the only way to get our rowing workouts has been to join the thousands of people who have attended our instructor certifications, or randomly grab the workouts we post online. What’s been missing is a systematic approach to working out with the rowing machine. In putting together our Meter Monster and Flywheel Frenzy rowing workout programs we took into consideration how you would use the workouts to best fit your fitness level and goals. The thinking has already been done for you! All you have to do is print out the PDF and take it with you to your gym or home rowing machine. Total-body fitness! You love the rowing machine for its one-stop-shopping, total-body fitness: The Zen of the flywheel calls you. Dumbbells? Kettlebells? No thanks. No long rowing intervals: You’d rather stick hot needles in your eyes than sit on a rowing machine for any significant distance. These workouts typically only require a few minutes of rowing at a time. I get bored easily: Intervals for the win! Every workout is different, and will help you get fit using the principle of muscle confusion – constantly keeping your body guessing. Use as much, or as little, extra equipment as you want: Choose from workouts that use only your bodyweight for resistance, or grab a dumbbell, kettlebell or other equipment for more resistance and challenge. You’re an indoor rowing instructor looking to mix it up: Flywheel Frenzy workouts are a great way to add variety to your classes, both on their own and as a template for your own programming creation. The workouts in Meter Monster and Flywheel Frenzy were created by UCanRow2 founder Terry Smythe and our team of master rowing instructors. 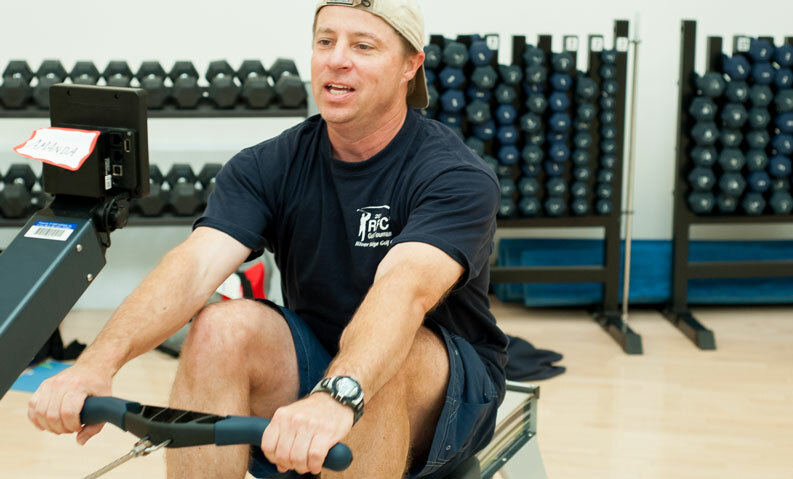 Terry has more than 4 decades of experience rowing and coaching on-water athletes, and working with indoor rowing clients and classes. Terry has helped thousands of people row better on the rowing machine, significantly improve their fitness, and have fun doing it! 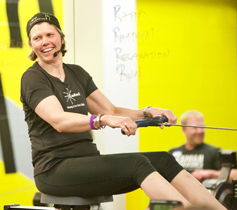 She has also trained more than 1000 fitness instructors to teach indoor rowing classes on the most amazing machine on the fitness floor. No other machine offers the total-body, non-impact benefits of the rowing machine. We have personally seen – and experienced – how it transforms lives. I’ve just started rowing. Are these programs right for me? MeterMonster and Flywheel Frenzy assume a basic level of familiarity and stamina for indoor rowing and, in the case of Flywheel Frenzy, basic strength moves. You should be able to row comfortably for at least 20 minutes at a time before beginning either program. If you’re brand new to rowing, we recommend you start here. I’m not sure my rowing technique is good. Can I still do these? Yes! We have included links to technique reviews in both programs. If you would like more individualized coaching on your technique let us know. I LOVE rowing. Can I combine both programs? Of course! There is a special discounted price if you buy both programs at the same time. What equipment do I need? For Meter Monster, a rowing machine and nothing else. For Flywheel Frenzy we’ve given you a range, from just your bodyweight to a pair of dumbbells or a kettlebell, on up to more specialized equipment like battle ropes, or medicine balls. You choose how complicated or streamlined you want your workout to be. What if I’m taking other fitness classes or following another workout program right now? We designed these programs with the idea that they would be your main form of training. However, you could easily sub in one of these workouts on either a moderate-intensity or high-intensity day a couple of days a week. Just pay attention to your effort level and listen to your body. Is there coaching with this program? There is not, these programs are DIY (do-it-yourself). They do, however, include a suggested calendar for how you can use the workouts over a period of weeks. Want more help? No problem! Refer to our list of certified indoor rowing instructors if you would like to find help closer to you, or contact us for online coaching. WHAT HAPPENS NEXT AFTER I PURCHASE? Within 10 minutes of purchase you will get a link from UCanRow2 to download your PDF workout files (Be sure to check your junk email if you don’t see it). If you have any questions at all, please don’t hesitate to EMAIL US!